Sunday evening was really a surprising one for people in Indore because it was the first time ever when the city residents saw a robot managing the traffic on roads, People were amazed to see a robot controlling the traffic in such a way that too so smoothly. The robot was placed at Barfani Dham (Ring Road) red light. It transpired that this was a trial run by the Madhya Pradesh traffic police and it went off quite successfully. Whoever saw this rare event, halted the vehicle and tried to click pictures of the robot as it was an altogether a new thing for them. According to Indore Police, the first trial of robotic traffic control was successful. In India it has been named ‘Traffic robot system’. Before that robot has been working in Africa to handle traffic. This is the first experiment in India’s Indore city after Africa. 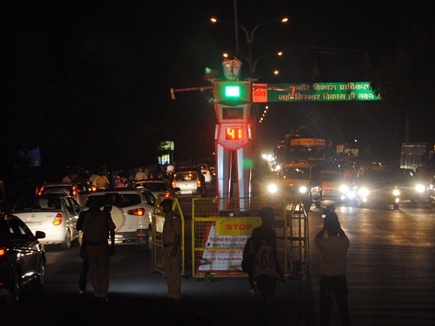 According to sources, the cost of this traffic robot has come to nearly three million which will be gradually reduced.